﻿Tell me those don't look amazing? These Peppermint Pattie Stuffed Cupcakes are out of this world good. 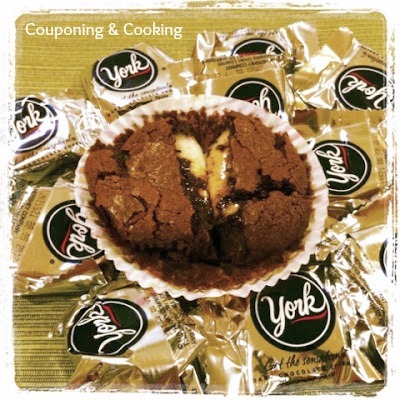 I love York candies so when I saw it stuffed inside a dark chocolate cupcake I knew I had to try it. The recipe is one that I adapted from Martha Stewart's Cupcakes and my family considers it to be one of their favorite things I bake. I made this batch for my Dad's birthday and I think this is the 3rd year in a row he has requested these for both his birthday and Fathers' Day. They look and taste complicated but they really are quite simple to make. You don't even need a mixer; everything is done by hand. The recipe below makes about 24 cupcakes. 1.) Create your own double boiler (or use a real one if you have it) by placing a heat proof bowl over a pot of boiling water and use it to slowly melt chocolate and butter until completely smooth. I find it goes quicker if the butter is room temp. and is cut up in to smaller pieces. 2.) Pour melted mixture into a larger mixing bowl and whisk in the sugar and the salt. 3.) Whisk in the eggs to combine. Mixture might be a little grainy but that is ok, it has never seemed to affect the consistency of the final product. 4.) Gently whisk in flour and cocoa until smooth. Don't over mix. 5.) Line a muffin/cupcake tin and put one tablespoon of the batter into the bottom of each liner. 6.) Press a peppermint pattie into the batter. 7.) Top with 1-2 more tablespoons of batter. I just use whatever will completely cover the pattie. Make sure you let them cool for a bit before eating since the insides of the peppermint pattie can be dangerously hot. Enjoy! these look so yum! What kind of frosting do you put on it? yum, I would so do these with my home made patties, but then i wouldn't share, all mine! share your recipe for home amde patties? oh wow!! homemade?! please, do share! Love peppermint patties. We buy them in bulk and freeze them! These look super-tasty! Please stop by Foodie Friday and link up too! This could be my downfall! They look totally sinful. Can't wait to try them. I just love Peppermint Patties so I know that these cupcakes would just be fabulous! Hope you are having a great week end and thank you so much for sharing with Full Plate Thursday. Issue coco powder only says half half what half a cup ? Sinfully delish! I've got to try these! Oh, that sounds absolutely delicious! I will definitely have to try this one soon. Yummy! Um. Yum. Love peppermint patties. Can't wait to try these. Those look amazingly sinful. YUM. Come visit us. We have some wonderful things to share this week. I love peppermint, and these look so incredibly good. Thanks for sharing the recipe and a great tutorial! Thanks for sharing your creative inspiration at Sunday's Best. Thanks for linking these babies with See Ya In the Gumbo. What a fun idea! Love it! These look so yummy!!! I've gotta try them sometime. Thanks for sharing at Terrific Tuesdays. These look amazing. Thanks for sharing at Fabulous Friday. Spectacular cupcakes. These are being featured, this week, at My Meatless Mondays. Thanks for sharing them with us. A novel idea and it sounds delicious. Congratulations - you've been featured at this week's Inspire Me Monday at Create With Joy! Be sure to stop by and share your latest creations with us! Yum. I love chocolate and mint, so I'm sure I would love these! Thanks for sharing at oopsey daisy! Congrats for being featured on Create With Joy today!! These look so yummy! I've pinned them to try! Thanks for linking up on Tuesdays Gone! Peppermint Patties are my hubby's favorite candy. Can't wait to make these for him! Thanks for sharing, pinned!